﻿ Want To Win? Burn The Boats! Imagine this: you’re hanging out at the dock one day, looking for work and maybe an adventure. You hear rumblings of a great voyage about to take place and are intrigued to learn more. After hearing a few details about the journey you pack your things and board the ship ready for whatever awaits beyond the horizon. Prior to leaving your safe and comfy home, everyone’s expectations were clear; simply arriving at your destination would be a best-case scenario. Somehow, miraculously your ship arrives roughly where you’d hope to land. You take a deep breath while examining the new, strange and exotic land where you just arrived. After unloading the ship, you huddle with your compatriots and eagerly listen to the captain for further instructions. After congratulating you all for the successful voyage he asks you all to turn around to look at the boats in the water. The boats have been your home for countless days and nights and your last connection to the homeland you left beyond. Then it happens. First a spark, then a flame and finally a wave of heat thundering towards the shore where you and your fellow adventurers watch as the fleet burns in the water. A shocked and uneasy feeling pervades the audience as you all realize there’s no going home. You’re in this strange land to stay and you’re going to have to make it work. The above technique may seem extreme but has been employed by leaders for hundreds of years. As I read and discover more about leadership, I’ve found a common thread that runs throughout – all successful people have one thing in common; they burn the boats. What does that mean in today’s day and age? It means that without a burning desire to make it work, most often people won’t. When we provide ourselves with an out, a way of reverting back to previous behaviors, habits or business practices, often we will. We find comfort in the familiar and solace in knowing what will greet us the next day. However, in a society where things move fast and the best way to make your mark is to do something different or to add your unique spin, we are at odds with our natural inclination. Ultimately, this is a conversation about fear. Fear motivates people to seek the familiar and I believe that fear is what stops many people from succeeding. Present us with something new and often we’ll find a reason to return to the old. It’s absolutely necessary to have fear and impossible to rid yourself of it but truly powerful leaders learn to address the fear then overcome it in a productive way. Most of the best brands out there have had an “all in” moment at least once in their company’s history. I don’t advocate taking unnecessary risks that could ruin lives. But I do advocate removing the safety net. How do you know when it’s your company’s time for an “all in” moment? Use your gut and believe in your intuition; it’s gotten you this far and will always serve you well so long as your pursuits are well intended. In my experience, the best things to occur here at Roma Moulding happened when we’ve burned the boats. There will be fear and insecurity but when you honestly open-up to your team and say, “let’s work together and do whatever it takes because we’ve burnt the boats and there’s no going back,” you’ll be surprised at how they rally and rise to the occasion. Share the Vision: You need to believe in and share your vision with those around you. Check out this blog I wrote titled, Dream Big, Dream Often for tips on sharing your dream with others. Devise a Committed Team: Now that you’ve shared your vision, find those that are adventurous enough to cross an ocean with you. If you’re having troubles bringing great people onboard your team, I recommend a blog A Is For Awesome, B Is For Better Keep Looking that I wrote earlier this year. Foster Leaders Within the Group: You need trusted people to help you make your vision a reality. You likely already have a budding superstar on your team just waiting for the opportunity to put all they’ve learned into action. Wondering how to develop outstanding leaders? Check out my blog on Beyond You Leadership. Once you’ve completed the above you’ll be ready to remove your safety net and truly commit to the task at hand. Congratulations my friend, you’re ready to burn your boats! Has your company ever gone “all in” on something? We’d love to hear about your experiences in the comments below. Really great stuff and an awesome way of understanding how committed you are to something. This one struck a cord with me. We say we we want to move ahead, but we’re inclined to hold on to those things that make us feel comfortable and safe. The familiar. Life is about moving forward!!! Bye Bye Boats! Great Blog and Great Truths! Great blog once again. I used to be fearful of change until six years ago when I made a decision that would affect the rest of my life with great impact. Since then, I have not looked back and anxiously await each and every new adventure…with no safety net, a phrase which I live by! Amazing blog! Absolutely love it & this applies to every area of our lives! From business/career to relationships & marriage, to health & family and so much more. Burning the boats being 100% in & committed to what we do fully is priceless – it’s truly the one ingredient that makes everything work! Thanks for the reminder and constant inspiration! Just like the safety rope in the Dark Knight Rises. Batman approves. “All in” is like working out. Difficult to start but a great feeling when it’s over. I burnt my boat when i came from the corporate world – no more… Think the ashes have been dispersed just like a long gone memory. WOW is all I can say to how timely and the level of synchronicity this blog has been for me. I have just had my “ALL IN” moment and burnt the boats, bridges, docks and buoys. The entire retail space will be mine in October and I am looking forward to expanding and presenting a beautiful showroom with the Roma lines exclusively featured. I am dedicated to offering this to my customers because of the incredible feedback and support I have received from Tony Gareri , Gordon Thain especially and the wonderful people at Roma Moulding. Thank you for your support,kind words encouragement. I am excited to Move Inspire and WOW. Great Blog Tony!!! That is 100% true.. when you playing poker and go all in, you don’t look back.. you know that you will win the hand! Even if its not the winning hand your confidence will say it is!! Burn the Boat because I have 4 of a kind!! Going “All in” is definitely scary. Thank you Tony for opening my mind to new things. Great job as usual Tony ! Sei GRANDE Tony Gareri !! I love burning boats and NEW challenges. I might be a little nervous at first, but to adapt and make something new and at times uncomfortable work is a RUSH from beginning to end! Absolutely spot on Tony, and an amazing metaphoric story to start/back it up! for someone who runs a business as well, and wants to change it for the better… This an amazing roadmap! Cheers! When you argue for your limitations and comforts, you perpetuate them. Great Blog Tony! To our ROMA warriors on the road, how do you think this applies to you? How can you burn the boats of how you’ve done things in the past to radically change your results by the end of the year? Radical changes will produce some radical results! Great Inspiration Tony! To burn the boats is definitely scary but when you are surrounded by amazing people that all believe in the same mission, your fears are left behind! Burning the boats or going all in, how ever it’s said doesn’t matter. Working with some fire in you is always good. When it comes to our personal life and our professional life, we should always try and give it our all. If something is worth doing, shouldn’t it be done right? Great food for thought, gearing up to end the year powerfully! Thanks Tony! Burn the boats or remove the crutches. Either way, failure is not an option!!! A vision mixed with passion, joy, and commitment allows us to burn our boats! 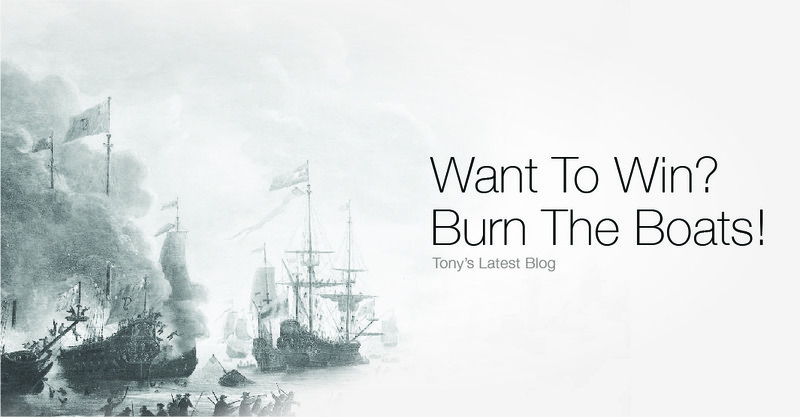 Thank You Tony for allowing us to burn our boats! Great Blog Tony!! Burn Baby Burn!!! I’m All In!! This is one of my favorite blogs to date! Moving outside of formed comfort spots can ba a challenging sea to navigate, but seeing the blaze at the end of that journey usually does well to warm the soul. I would have to admit I am about mid-voyage and am getting increasingly eager for my feet to touch down on a new shore. Thanks as always for the inspiring words Tony! Great blog to read again as 2015 approaches! Remove my safety net. Follow my gut and intuition!! Bring on 2015!